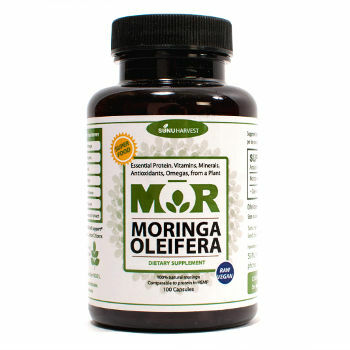 Selina Naturally® is proud to introduce MoR® Moringa Oleifera! Since ancient times, people have used the leaves and other parts of the Moringa tree to promote optimal health. Today, Organic Moringa Oleifera is making a comeback as modern wellness experts rediscover this age-old nutritional and energy supplement. The leaves of the Moringa tree are tiny, green, and packed with over 90 nutrients, 46 antioxidants, and all 8 essential amino acids. In particular, Moringa leaves are rich in vitamins K, A, C, B6, Manganese, Magnesium, Riboflavin, Calcium, Thiamin, Potassium, Iron, Protein, and Niacin. Sunu Harvest® MoR® Moringa also comes in a ½ Pound bag of Organic Moringa Oleifera powder. Ounce for ounce, Moringa contains seven times the Vitamin C found in oranges, four times the beta carotene of carrots, three times the iron of spinach, four times the calcium as milk and three times the potassium of bananas. Moringa is extremely rich in flavanoids, which have antioxidant, anti-inflammatory, and antiviral properties. In traditional Ayurvedic medicine, Moringa was used to treat over 300 medical conditions. Today, health practitioners all over the world advise Moringa as a natural remedy for inflammation, malnutrition, wounds, diabetes, acne, iron deficiency, memory/attention problems, high blood pressure and other conditions. Moringa promotes increased energy and vitality, making it a good choice for working professionals, athletes, students, and senior citizens. Moringa is completely safe and can be used for people of all ages; you can even give Moringa to pets! 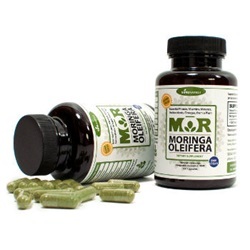 Ingredients: 100% Pure Moringa Oleifera 250mg per Capsule. Suggested Use: As a dietary supplement take 3 or more capsules per day or as directed by your healthcare practitioner. Mix in juice, smoothie, yogurt, or anything you desire. Go to www.mormoringa.com for more recipe ideas. Store in a cool dry place. Moringa is recommended by UNICEF, WHO and other NGO's.